It’s one of the questions we get asked the most about wedding day “How much time do you need for photos?” Thankfully, our brides come to us for advice. After all the cake is eaten, the flower petals swept up, all that remains of your wedding day is your dress hanging in the back of your closet and your photos and video. 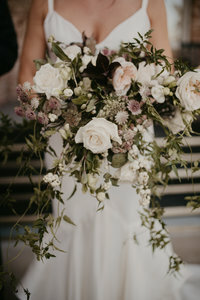 It’s important to set up your wedding day timeline to ensure both your photographer and videographer have time to create the best imagery for you to visually remember your day. Here are a few of my favorite tips to ensure you get what you want to remember your big day for years to come. Tip #1 – get with both your photographer and videographer ahead of time to make sure you’re planning enough time for them to get what they need. Communication is absolute key to getting all the photos you want and keeping your photographer up to date on special events that they may not know about. 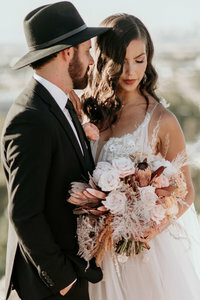 If you have special requests, don’t be afraid to ask your photographer or videographer – we’ve had special requests like our couple wanting to read their vows to each other during their first look to visiting a hospitalized family member after the reception. We’re always happy to make special arrangements and chances are, your photographer + videographer is too. Tip #2 – Ask your families what posed family portraits they want. This one is HUGE! Though those family portraits can seem pesky, it’s great to ask ahead of time what your families want so that it can be quick and as painless as possible. 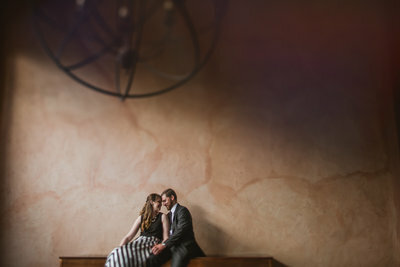 Tip #3 – Reserve at least 45 minutes for couples portraits. This may seem like a long time, but on wedding day, moving around in a big dress is hard. It takes a lot of team work to get our couples plenty of variety on their wedding day. Whether you’re doing a first look or portraits together after the ceremony, this is often your ONLY time alone together (well, as alone as you’ll be until you leave!) so it’s best to make the most of it. 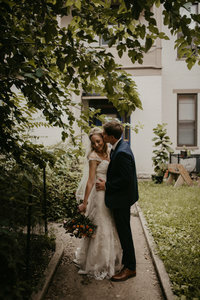 45 minutes to 1 hour is optimal for both the bride and groom to enjoy an hour together on wedding day and your photographers and videographers can get plenty of variety without feeling rushed. It’s great to communicate with your photographer what you want in terms of bridal party photos – that way, they can make sure and reserve enough time to get what you want with your best friends! Tip #5 – Make sure you purchase enough time in your contract. We only include all day wedding photography for this reason, however not every company is the same. Make sure, no matter who your photographer or videographer is – that you have enough time contracted to get the coverage you want. If you decide to cut down on anything – cut down on the getting ready footage. Photographers and Videographers can often get what they need of “getting ready footage” very quickly, even if they need to recreate a few key elements to get what they need for the storyline. You definitely don’t want to feel rushed at the end of your wedding day and be worried about time constraints at your reception or feel like you have to leave early so they can capture your exit. BONUS TIP : Make sure and pad your time in case you’re running late. It’s always great to add in extra 15 minutes here and there to ensure that if you’re running late, your photos and video don’t suffer. I hope these 5 tips to building the perfect wedding day timeline for photos and videos helped! If you need help building your perfect wedding day timeline, definitely contact your photographer! They can help with so much!